Unless you have a free source of fuel or electricity, wood is the least expensive way to heat your home. 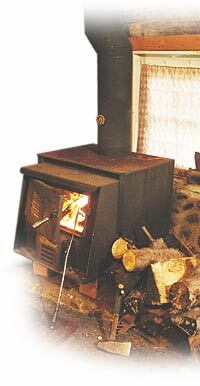 With the rising cost of petroleum products, heating with wood makes sense. 1 - values taken from Purchasing Firewood in Alaska published 10/96, AK DNR/DOF/CFP. The Btu values are based on dry or seasoned wood with 20% moisture. Wet or green wood has higher moisture and requires a large amount of heat to evaporate the moisture before the wood can burn and give off heat. Cutting firewood in the late winter and early spring allows the wood to dry through the summer and be ready for the coming winter. Use care when burning ocean driftwood with its considerable amounts of salt. When burned, these salts are highly corrosive to wood stoves and chimneys. Also, check chimneys more often for mineral build up. 1. Soderstrom, Neil. "Get Your Firewood This Summer." About Town Articles & Stories. AboutTown. 20 Jul 2006 http://www.abouttown.us/dutchess/articles/summer02/firewood.shtml. 2. Alix, Clair, Brewster, Karen "Not All Driftwood is Created Equal: Wood Use and Value Along the Yukon and Kuskokwim Rivers, Alaska" Alaska Journal of Anthropology 2(1)(2004): 2-19. 3. "Straight Answers to Burning Questions: Quick Tips for Cleaner, More Efficient Wood Heat." hpba.org. 2006. Hearth, Patio & Barbeque Association. 20 Jul 2006 http://hpba.org/communications/FactSheets/answers.shtml. 4. Shelly, John. "FOR-35 Firewood." U of Kentucky College of Agriculture publications. 01July1986. University of Kentucky. 20 Jul 2006 http://www.ca.uky.edu/agc/pubs/for/for35/for35.htm.